Google webmasters team recently announced on their blog that they will start including page loading times as a factor of determining page rank which I wrote about in Faster sites make Google happy. Yesterday AdSense team also announced the same news on their blog, with one difference, they say: “AdSense is built to load ads quickly so there’s no need to change your AdSense setup.”. Hmm, loads ads fast… is that really true? 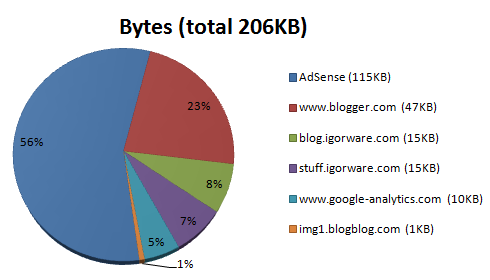 Lets look at the results from www.webpagetest.org website which adsense team also recommended in their blog post. I tested one of my blog post pages which has three ads from AdSense, two are text only and one can either be image or text. It turns out that AdSense makes my blog about 5 times slower on first view and more than 6 times slower on repeat views when everything is already cached in user browser. What we can see here is that AdSense is taking 20 request and 115KB of traffic, in my opinion this is a lot. 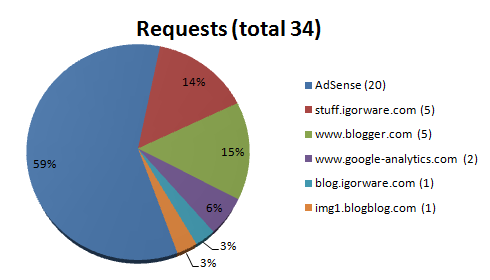 For my blog thats more than 50% of traffic and requests only for AdSense, both requests and size should be as few as possible. If you’re thinking “OK but when those files are cached it will be less”, and you would be right it is less but still takes more than 50% traffic (13 out of 16KB) and requests (3 out of 6). Requests are really files, that means that AdSense needs 20 files to show 3 ads on my page. Half of those are cached for only 24hours. So if you have a user that checks their favorite website once a day, their browser will download almost all AdSense files over and over again each day. Nothing (except remove adsense from you website :-]). Even if there were some possibility to speed up AdSense code by changing it, you can’t do that because you will violate TOS and most likely get yourself banned. Hopefully they will cut down number of files needed to show ads and increase cache time, other than that I don’t think they could do much more.